Our annual Swim-a-thon will be held during normal PE lessons on Tuesday 6 and Wednesday 7 November for all children in years 1-6. Swim-a-thon forms have been given to students last week or you can download them on the link below. The forms are to be returned by Friday 23 November. All forms and money are to be returned to the locked boxed outside the office and/or money to be deposited via Qkr! The Department of Education is holding ‘community sessions’ to facilitate community input into design of the new Inner City South State Secondary College. One session was held on Saturday 27 October and another is to be held on Thursday, 1 November from 6pm to 8pm at Dutton Park State School. Check the Building Future Schools website for details. Several members of the Buranda State School community attended the session on Saturday and have indicated attendance was quite worthwhile. It is the P&C’s understanding that the final catchment will be announced within the next four weeks. We will keep you posted with developments. Come to next week’s P&C meeting to hear more and have your say. The meeting will be at 6pm in the library on Wednesday 7 November. We are looking forward to meeting new families at the Prep Orientation this Friday. Our Uniform Shop will be open, ready for you to purchase your Prep's new uniforms! To make P&C payments a lot easier and stress-free for you, the P&C uses an app called Qkr! (You may have received an information sheet in your enrolment pack on how to download). Qkr! is available through Google Play and iTunes and it would be awesome if you could download and set it up with your debit/credit card before Friday morning. Note that your card details aren't stored on your phone and, if you prefer, you can choose to enter your card details for every transaction. The P&C uses Qkr! for tuck shop, uniform shop, fundraising and P&C events and our parents love how easy it is to use. We send reminders about tuck shop and order deadlines; there's no more searching for loose change or cash; and you can place uniform orders at midnight! Of course we will have volunteers to help you on Friday, so bring your smart phone with you and we can help you through the process! The Qkr! app is the preferred method of payment for our uniform shop, although we do accept direct bank transfer payments too. Uniforms will be available to check sizing if needed, but if you know the sizes you will need for your child, you can order through the Qkr! app before Friday and the uniforms will be ready for pick up Friday morning...stress free! Trivia Night on 23 November — put it in your diary now! FORGET your worries for an evening and then some. Come and join the party in the school hall with the antics and supreme FUN that is BURANDA'S 2018 TRIVIA NIGHT. FABULOUS FOOD and BRILLIANT LIVE MUSIC starts at 6pm. Questions start at 6.40pm. So come along, mingle, and wash the week away. We have a new QUIZZmistress...NEW Questions...NEW fun. We are proud to announce yet another sustainably-driven P&C Buranda Event, with no disposable cups. So, bring your Buranda tumbler (or non-glass alternative) or pick up a new BSS Centenary stainless-steel tumbler at the reduced inclusive price in your entry. You can also pick up a tumbler on the night for $10, which includes your first drink. So gather your mates, pals and peeps and start organising your team. Don't know anyone...yet….no worries: we can team you up. See the signup sheets outside each classroom. Come on and let your hair down and support our kids by coming to Buranda's FIRST and LAST EVER trivia night hosted by QuizMistressFitz. Ted: I had so much fun, just watching everyone else have fun. Sarah: I'd forgotten what it was like to get out with everyone again - without the kids. Anna: Such joyful, witty banter at our table, a complete evening out..oh, and did I mention the great food? Kellie: I didn't know you guys had such a great turnout and spirit for such a small school. We're coming again next year. Mark: Loved the heads and tails section, the hilarious Burns or Trump section and the local trivia. Geoff: The usual cool live music Buranda Events have been come to be known for. A real highlight. Tracey: AWESOME!! !.............PS It's my 4th year in a row. Danni: My highlight is the table drawing. Framable works of Art. I hope everyone had a great break. You will find term 4's menu on the Tuck Shop page and also up around the school. You can order in Qkr! anytime now. Tuck shop will commence in week 3 this term, then fortnightly after that. I am also looking for someone to help out on an ongoing basis with the iceblock sales on a Thursday. You would need to be at the school from about 11am until about 1130. I purchase the iceblocks so it is just 30mins in the tuckshop on Thursday. Perhaps you could team up with a friend and do every 2nd week. Let me know if you are interested or even if you could be an emergency contact for those weeks we are really stuck. The P&C is delighted to welcome Jodie Holloway as a new uniform shop convenor. Jodie is busy turning the shop into a bright, welcoming place to buy your uniforms. The new shop opening hours are Wednesday 2.45pm—3.15pm. As usual, you can order uniforms via Qkr! and have them delivered to the office for you to collect at your convenience. The annual swim-a-thon will be held in class in Week 5. Forms will go home with students soon. It will be great to be able to swim in a heated pool this term after much lobbying to have the pool to be heated as part of the remediation program compensating for the multi-storey tower that is planned for the neighbouring block on Cowley St/Logan Rd. If you love mangoes, here’s your chance to indulge in fresh juicy mangoes straight from the farm and support the P&C's end of year fundraising drive. The Mango Fundraiser only use Bowen Special Mangoes, which are more formally known as Kensington Pride Mangoes. They are packed in a single layer tray, with approximately 7kg of Mangoes per tray. The number of Mangoes per tray depends on the size of the fruit, and may vary from 12 large Mangoes up to 23 small Mangoes. These mangoes are picked and packed during the premium harvest and delivered to the school straight from the farm. They are full of flavour compared to the supermarket ones, as they are allowed to mature prior to picking. You can order for your friends and families as well. Take an order form to your workplace, show friends, and families to gather orders. Winners are grinners, and there were big smiles on the faces of all those who took home prizes from our Buranda Fest bumper raffle on Sunday. Thanks to all the individuals and businesses who donated prizes, and to everyone who bought tickets; the raffle alone raised more than $3000 for school programs. A special shout out to the Olsen/Black family, who sold more than 100 tickets! 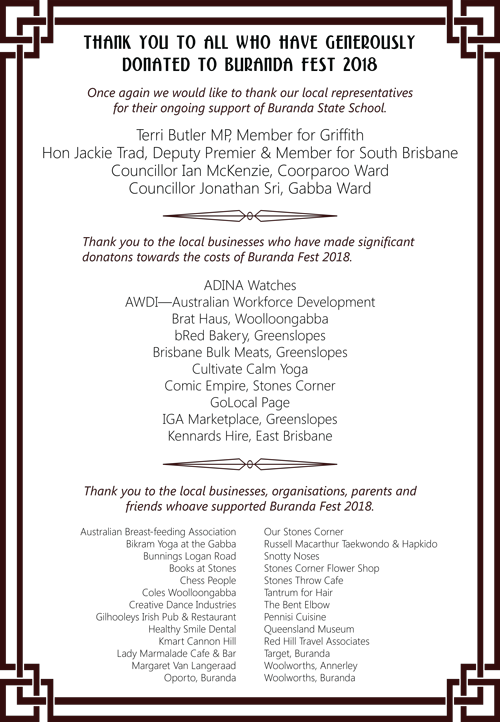 Thanks to our local business community and elected representatives, who supported Buranda Fest by donating goods, prizes, services and cash to help offset the fete costs. With their help the P&C has raised around $20,000 for school programs (final figures pending). We deeply appreciate their support and encourage school families to pop in and say thanks. Major partners are offering discounts to school family and friends: take a look at their deals on our Community Offers page.